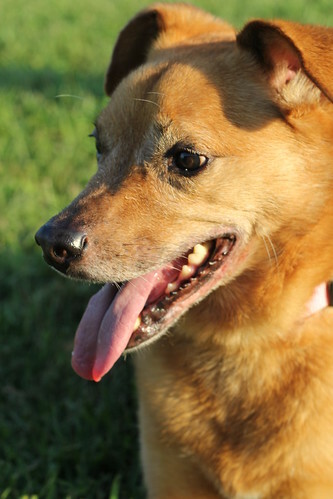 Jo-Jo, a mixed-breed shepherd, lab, terrier mix, was first seen running loose in Doylestown, Ohio in March of 2012. Obviously starving, but somehow having miraculously survived the winter living in the woods, FAAAS was called by a good Samaritan, now friend of the sanctuary, after she was found on their deck scouring for food and water. She ate ravenously and quickly retreated back to the woods, finally being rescued by FAAAS two weeks later on April 11, 2012. Named Joey after a survivor character from the “Warhorse” film, she first lived in the vacant stall of beloved resident and family member, Teddy Bear, who had died suddenly of a massive stroke the day before. Skin and bones, acutely underweight, the sadness in this little girl’s eyes was hard to bear. Supporters and friends donated much-needed blankets, food, even a teddy bear plush toy to comfort her, and the work of rehabbing Jo-Jo and restoring her health began. On April 14, less than one week after Jo-Jo’s rescue, FAAAS was once again called upon to rescue and provide refuge to a thoroughbred race horse left behind at Beulah Park racetrack in Columbus, Ohio. Freedom would need the stall Teddy Bear had left vacant. Michele moved Jo-Jo to the family residence so she could give Jo-Jo the 24/7 care she clearly needed. On May 17, 2012, with over a month of rehab and still not gaining weight, extensive blood work confirmed that Jo-Jo was suffering from Exocrine Pancreatic Insufficiency (EPI, for more information visit www.epi4dogs.com), a condition that leaves her without the digestive enzymes needed to absorb nutrients from food. Today, Jo-Jo is a happy, healthy little girl, kept from starvation only by costly pancreatic enzymes administered twice daily, along with daily B-12, a strict organic seafood diet, and the love of Michele and the wonderful volunteers of Forever Amber Acres Animal Sanctuary. She became a certified therapy dog and visited area nursing homes once a month with Tara A. her handler, who went through the training with her; until two years ago when hip displasia caused us to retire her from therapy. If you’d like to help with continuing JoJo’s care at Forever Amber Acres click below to sponsor!